Butler Shaffer is a distinguished libertarian legal theorist who has for many years taught at Southwestern Law School in Los Angeles. In this monograph, he addresses an important question that has aroused much interest among libertarians: What is the status of intellectual property? Are patents and copyrights legitimate? Shaffer responds with an appeal to fundamental libertarian principles. Only arrangements that people freely negotiate with one another are acceptable: laws imposed by a coercive state are not. Judged by this standard, intellectual property fails. People may make contracts that limit the sale or transmission of ideas or books, but these bind only those who make them. Intellectual property laws, by contrast, apply to everyone, whether people accept them or not. These laws could not have arisen through voluntary agreements. Defenders of intellectual property maintain that inventors and writers need protection for their work. Without patents and copyrights, inventions and creative work would be impeded. Shaffer responds that most of the great creators and inventors of the past worked without patent s and copyrights. Leonardo da Vinci and Shakespeare, for example, did rather well without this sort of state privilege. 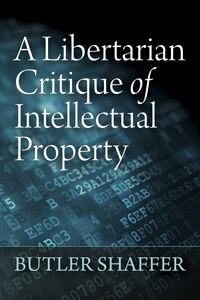 A Libertarian Critique of Intellectual Property is a major contribution to libertarian legal theory and an indispensable guide to a vital topic.